Crest 3D White Professional Effects Whitestrips are some of the most effective whitestrips available on the market. They are easy to use and suitable for those who have moderate yellowing or brain stains. The longer treatment time ensures that results last for 12 months and beyond. 1.) Do Crest 3D White Professional Effects Whitestrips work? Crest 3D White Professional Effects Whitestrips utilise the same enamel-safe technology as used by dentists across the globe. They work by delivering hydrogen peroxide right into the core of the tooth, bleaching away years of staining and discoloration. Crest 3D White Advanced Seal technology means that there’s no slipping so you always get maximum coverage and maximum results (view details). Thousands of users swear by the Professional Effects Whitestrips and dentists have astounded at the professional-level results that their clients achieve at home. If that’s not enough, these Whitestrips have been awarded the Allure Best of Beauty Award two years running. 2.) 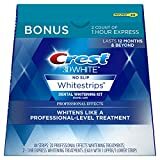 Are Crest 3D White Professional Effects Whitestrips safe? The use of Crest 3D White Professional Effects Whitestrips is completely safe when used as directed. All Crest 3D White products utilise enamel-safe technology but this doesn’t necessarily mean free from side-effects. With an effective whitening product like the Professional Effects Whitestrips, there is always a chance that there will be some tooth sensitivity or gum irritation. Both of these are temporary and not harmful, and using the product only as directed can help to minimise these effects. The amount of tooth sensitivity varies considerably from person to person. As the peroxide pulls out the stains, it can also draw out water from the tooth, leaving less protection between the nerves and the tooth surface. (This process can also leave temporary white spots on the teeth). If you struggle with sensitivity, try using Crest 3D White Professional Effects Whitestrips before bed. This allows time for your teeth to rehydrate overnight before they come into contact with anything. What if I already suffer with sensitive teeth? Professional Effects Whitestrips are safe to use, but you may experience heightened discomfort. If you still wish to go ahead (for the amazing results on the other side!) then it’s best to prepare yourself. Avoid hot or cold drinks within 48 hours of treatment, and brush with a sensitive fluoride toothpaste to help minimise pain. If that doesn’t sound appealing, don’t worry. You can still achieve a pearly white smile by opting for Crest 3D White Gentle Routine Whitestrips which use a milder formula but still give great results. You can expect great results from your Professional Effects Whitestrips in as little as 3 days. However, for the ultimate dazzling smile, follow the recommended treatment course of 30 mins a day for 20 days. As always, results vary depending on the individual. If you have extreme build up of stains, it may take a little longer to achieve your desired results. It is always worth noting that Whitestrips will not bleach any dental work. If you have many crowns, veneers, or fillings there may be some color mismatch. Lastly, Professional Effects Whitestrips work well for restoring whiteness to yellow or brown teeth, but they can have little effect on gray colored teeth. Gray teeth are often stained by the antibiotic tetracycline and require persistent supervised treatments to lighten. For best results, always use the product as directed and consult your dentist who can help guide you to the best teeth whitening process for you. How do I use Crest 3D White Professional Effects Whitestrips? Crest 3D White Professional Effects Whitestrips are incredibly simple to use. The strips will mold to your mouth and teeth shape, allowing for a comfortable fit. Paired with the Crest 3D White Advanced Seal technology which ensures the strips stay put, you can whiten as you walk, talk and even drink. 4.) How long will my results last? Crest 3D White Professional Effects Whitestrips give you a great result that last over 12 months. Some users insist that their results last years! As the Professional Effects Whitestrips remove 14 years of staining, this is unsurprising. Even if some of the brightness starts to dull after a year, the chances are that your teeth will remain brighter and whiter than they were before you bleached them. As always, many factors contribute to the longevity of results. Coffee, tea, red wine and smoking are the biggest culprits for staining teeth. This is especially true in the following 48 hours after treatment because the enamel is more vulnerable. Avoid staining foods and activities such as coffee, tea, red wine and smoking. Curries, balsamic vinegar and tomato sauce are also culprits. Foods that are highly pigmented and acidic cause the most staining. Rinse with water if you just can’t give up that morning cup of coffee. It helps to wash away the pigment before it has a chance to settle into the enamel. Clean your teeth thoroughly. The best maintenance for a white smile is to keep your teeth clean and healthy. Always remember to brush for 2 minutes twice a day and don’t forget to floss. You can even get a whitening water flosser which makes maintaining your smile between treatments simple and fun. Visit your dentist every 6 months for a regular check up. You can get a polish to remove any surface stains that are creeping in and they can best advise you on how to maintain a gorgeous smile. Nearly everyone who uses the Professional Effects Whitestrips gets great results. For those who have yellow or brown teeth that are otherwise healthy, these are a great option. However, not whitestrip is perfect for everyone. If you suffer from sensitive teeth, try the Crest 3D White Gentle Routine Whitestrips. Theses are formulated to minimise tooth sensitivity and gum irritation. If you have excessively crooked teeth or deep staining, try a gel kit and mouth tray like Opalescence Go. Gel kits allow the gel to seep in and around the tooth, makig sure that every surface is covered. If you are short on time, try the Crest 3D White 1 Hour Express Whitestrips that give results in as little as one hour. A bonus pack is also available. This includes the 40 whitestrips for a full treatment and 2 upper and 2 lower 1 Hour Express Whitestrips. Crest 3D White Professional Effects Whitestrips are some of the best teeth whitening products out there. Easy and safe to use, they give you professional-level results that last for 12 months and beyond. At around 1/10th of the price of professional whitening, it’s no wonder that the Professional Effects Whitestrips have garnered such attention. My teeth are not straight, will these whiten my teeth unevenly? The Professional Effects Whitestrips work well on many teeth types. If you have uneven teeth, be sure to press the whitestrips into all surfaces of the teeth. Even if you don’t apply the whitestrip perfectly every time, the 20 day treatment time makes for the most consistent results possible. Do I need to use these for 20 days for them to work? Whilst you can see results earlier than 20 days, for results that last 12 months and beyond, the full 20 day treatment plan should be followed. The instructions say to use for 30 minutes but can I leave them on for an hour? Whilst Crest 3D Whitestrips are safe, Crest are always careful to say that this only when used as directed. Longer isn’t always better and the treatment times advised give you the best and safest results possible. Using whitening strips incorrectly can cause gum irritation, sensitivity, and irreversible enamel damage. How long should I wait between using strips? Crest advise that the strips should be used once daily for maximum safety and results. Should you dry your teeth before applying? It is not necessary to dry your teeth before applying Crest 3D White Professional Effects Whitestrips. The non-slip Advanced Seal technology helps to ensure that the whitestrips stay put throughout the treatment time. However, if you still find that the strips move around, drying your teeth prior to applying the strips can help to maximise adhesive strength. Do the whitestrips cover all teeth? No. Crest Whitestrips are designed to treat the most visible teeth. This is typically the top 6-8 teeth and the bottom 6 teeth. Can I brush my teeth straight after using whitestrips? Yes, it is safe to brush immediately after using the Professional Effects whitestrips. It helps to remove any excess residue. However, if you experience gum irritation during treatments, you may wish to wait longer before brushing. Can Professional Effects whitestrips be used on veneers and dentures? No – these are only effective on natural teeth. Can I use these while I sleep? No – it is recommended that you use whitestrips for 30 minutes at a time. Sleeping with whitestrips in means that the hydrogen peroxide is in contact with your teeth for far too long and may result in irreversible enamel damage. Do the whitestrips dissolve or do they need to be removed? The whitestrips do not dissolved and must be removed after 30 minutes. Can I use these alongside a whitening toothpaste? Yes – whitening toothpastes can assist the whitening process and help to keep surface stains at bay. Can I smoke while wearing these? The Advanced Seal technology means that you can continue normal day to day activities while wearing the whitestrips. That said, your teeth are more susceptible to staining during the treatment period, so smoking while wearing the whitestrips may inhibit your results. Do Crest 3D White Whitestrips expire? Yes- Crest 3D White Whitestrips do expire. You can find the expiration date on the box. While the whitestrips are still safe to use pat this date, the effectiveness of the bleach may not be as strong. Pingback: NuSkin AP24 Toothpaste Review: Will It Really Whiten Your Teeth?